Don't miss out on this newly renovated home which features 5 Bedrooms & 2 completely remodeled full baths with awesome river front views. Peace of mind that no major renovations will be needed for years. Brand new Kitchen, 2 brand new baths, new gas heater, new central air, new duct work, new flooring, new appliances, and newly painted throughout. As you pull into the over-sized off street driveway you will step out and notice the awesome river front water views. Perfect to relax watching the water activity right from your own house. Step inside to the spacious Living room with new wood planked laminate floor, new windows, wall mounted TV and high hat lighting above. This area opens to the remodeled eat-in Kitchen with new shaker style cabinetry, new real butcher block counters, all new SS appliances, marble tiled back splash, wood planked laminate flooring and a side door to the driveway. Both of these rooms have beautiful water front views. The hallway features a storage closet w/newer (2013) hot water heater, spacious 1st floor laundry room with wood plank laminate flooring as well as A Brand New Full Bath with porcelain tile flooring. The 1st floor also features a 1st floor bedroom with new carpeting, and 200 amp electrical service. This room could be used as a home office. The 2nd floor features 4-5 super sized bedrooms with new carpeting and closet space galore. The 2nd floor also features another brand new porcelain tiled full bath with double sinks & vanity with a bonus makeup area. Walk up steps to the attic where the brand new gas hot air heater w/central air with all brand new duct work is located. Perfect location for easy filter changes & yearly servicing. Back on the 1st floor is a 35x12 screened in porch with new outdoor carpeting. Perfect spot to host those Summertime BBQ's on a covered screened in porch that overlooks the river. No worries about the weather or mosquitos on this enclosed oasis. The rear yard is fenced and features 2 sheds with no electric. The location is perfect for scenic waterfront walks and a convenient boat launching ramp just down the street. 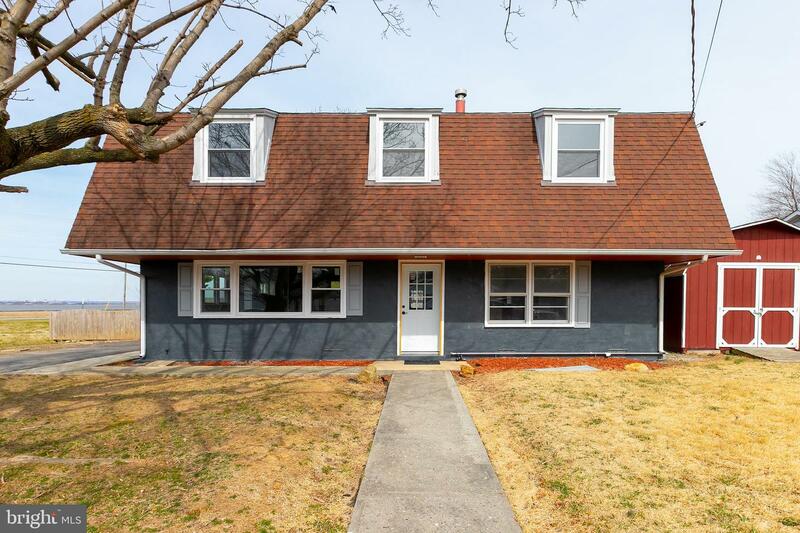 This home is also conveniently located to schools, shopping, restaurants, NJ Turnpike, Rt 295 North & South to be in Delaware within 5 minutes, the City within 20 minutes and Jersey shore within minutes as well. Hurry before someone else grabs this renovated home with awesome water front views!